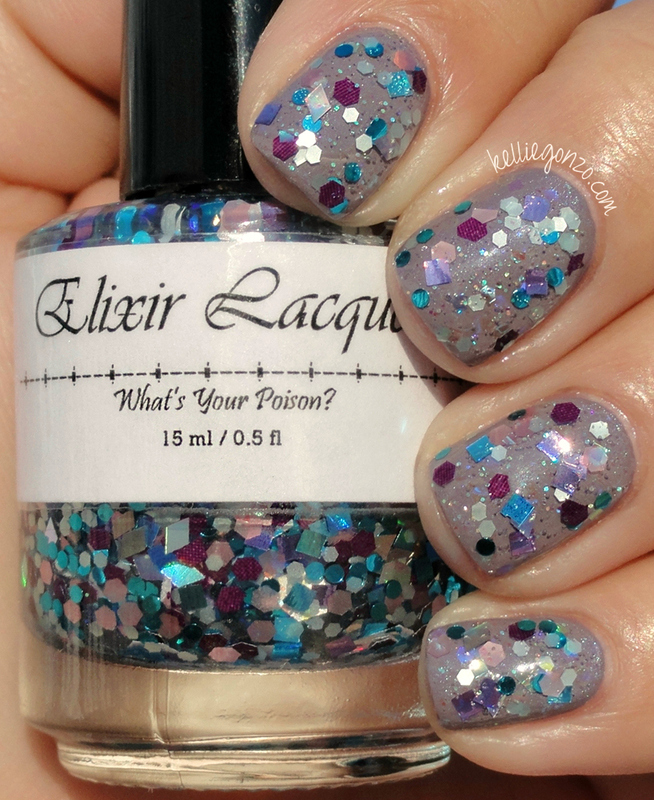 Elixir Lacquers has a new collection out called Roller Derby Ruckus. My sister plays roller derby and I know how badass those ladies are! What a fun idea for a polish collection huh! I was asked to try a few from the bunch to review so here they are! Kandy Krusher is a crazy collection of matte glitters and some micro iridescent glitz. The big pieces are bright blue hexes and purple squares, there are little hexes in hot orangey red and some medium shiny blue hexes. I can't lie, when I first saw this I was like wtf?! But on the nail it really works! I layered/dabbed two coats over my go-to black Cult Nails Nevermore. 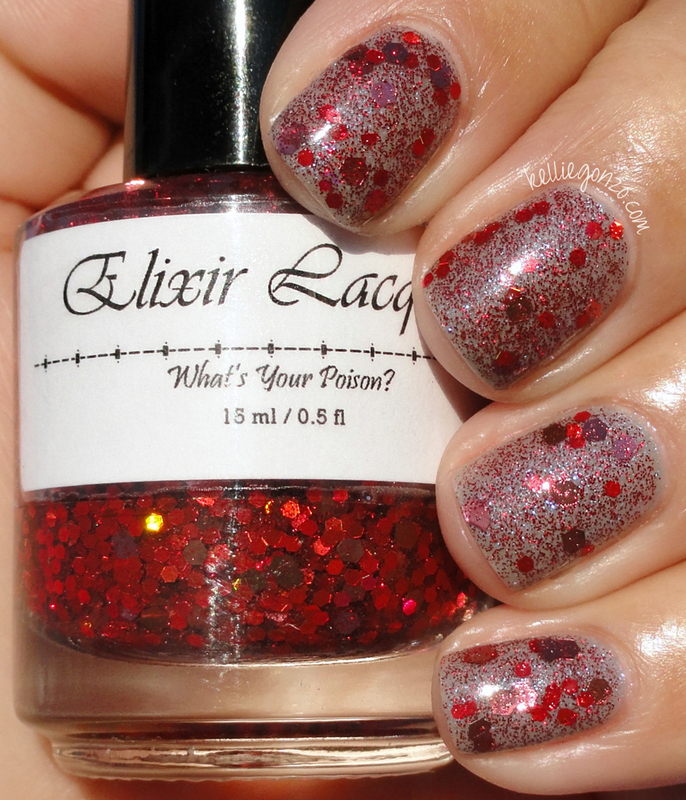 Trixie Treacherous has a clear base with tons of micro red glitter and shiny metallic hexes in red, rose, and pink. I think less coats of this would've looked nicer; this is three over Cult Nails Disciplined, a grey shimmer. Not my favorite, but maybe I can try it over a pink or something and it would make a better impression on me. 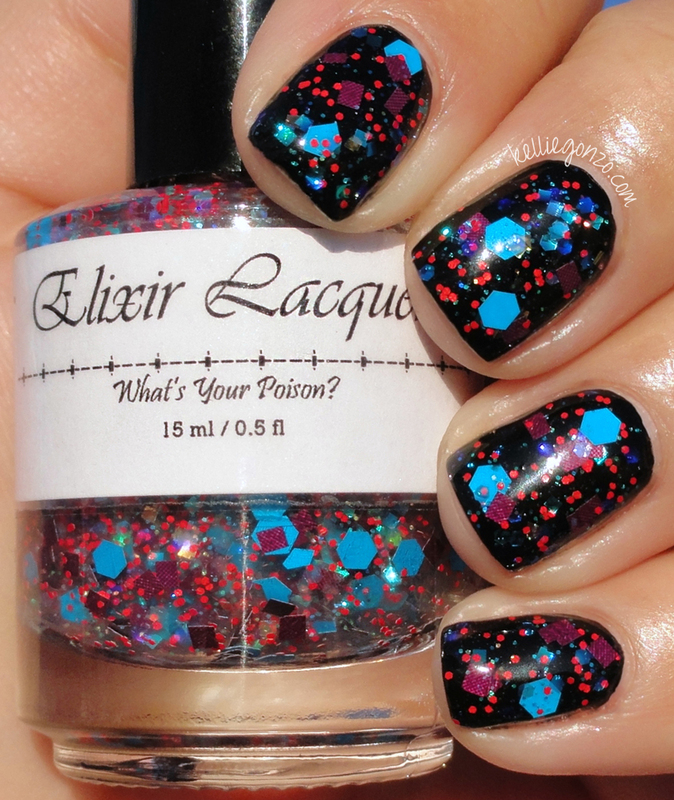 And for the special edition polish Nicole created for her anniversary, Elixiversary. This is a fab collection of matte and shiny glitters in all shapes and sizes in a soft color scheme of blues and purples. I layered three coats over Rescue Beauty Lounge Insouciant. The glitters were harder to get to stay on the nail because the base was pretty viscous, but it gave a nice payoff. The Roller Derby Ruckus collection will be released on Elixir Lacquers' website on February 1st for $10 each. Elixirversary is being released in very limited quantities, only 75 bottles total. Nicole is releasing them on the 16th of each month, the next restock dates are February 16th and March 16th for $12. What are your thoughts on these three polishes?